Check out our upcoming events — including conferences, workshops, webinars, and Twitter chats. 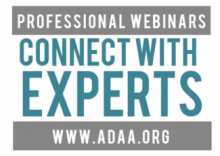 ADAA recently held a Twitter chat on the topic of depression around the holiday season, hosted by ADAA member experts Dr. Mary Alvord and Dr. Shane Owens. Read the post-chat blog post here. Read other past ADAA Twitter Chats here. The ADAA 2019 39th Annual Conference (March 28-31, Chicago, IL) will bring together an expected 1,400 clinicians and researchers from across the US and around the world who want to improve treatments and find cures for anxiety, depression and co-occurring disorders. Click here to learn more.